Mary Pickford plays two roles in Stella Maris (1918), directed by Marshall Neilan, and based on William John Locke’s 1913 novel. 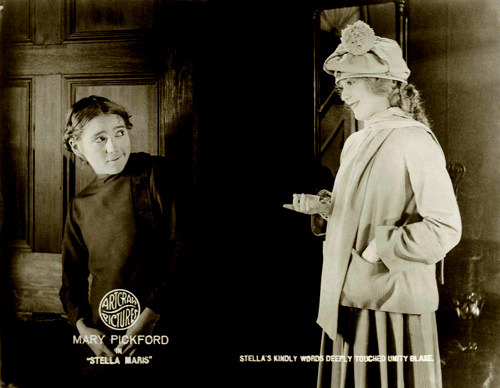 Stella Maris (Mary Pickford) is a beautiful, crippled girl who is cared for by a rich family, who shield her from the harsh realities of the world. Unity Blake (also Pickford) is a poor, uneducated orphan whose mistreatment as a child has left her afraid of everyone. Both young women fall in love with John, love which is complicated by the fact that he is still married to (though separated from) a bad wife. This screening with be accompanied by acclaimed silent film musician Stephen Horne. Stephen Horne has long been considered one of the leading silent film accompanists. He is based at London’s BFI Southbank but plays at all the major UK venues and at numerous festivals in Europe and North Amerca. Although principally a pianist, he often incorporates flute, accordion, and keyboards into his performances, sometimes simultaneously. He regularly performs internationally and in recent years his accompaniments have met with acclaim at film festivals in Pordenone, Telluride, San Francisco, Berlin and Bonn. He has performed his score for A Cottage on Dartmoor (1929) at many venues, including New York’s Lincoln Centre and Washington’s National Gallery of Art. As an adjunct to his work in silent film, Horne occasionally collaborates with a small group that re-creates magic lantern shows. Anyone interested in silent film should visit the website for more info and to request an invitation using the email kenbioscope@gmail.com. £3 (£2 of which goes to the Cinema Museum).